Urban development needs resources and produce wastes. At the same time, it is necessary to think about this development in an ecological way. Recycling wastes as a significant part in urban bring social benefits. Waste as a unique commodity located in the end of the industrial chain. However, the current waste recycling is still at a low environmental awareness. Extracting useful raw materials from waste is harmful and a heavy pollution. Especially the e-waste brings poisonous fume and heavy metals during recycling. The contamination of wastes has an impact on the surrounding environment. Nowadays Chinese government claims sustainable development and circular economy in order to keep the balance among economy, energy and environment. This essay will investigate the problems of e-waste recycling and further to introduce the crucial situation of recycling industry in Ningbo after the financial crisis. Firstly I will review the concept of e-waste and the situation of heavy pollution in recycling process. Secondly, I will discuss the issues of exporting wastes from developed countries. And then, this essay puts forward the concept of a circular economy as an economic model together with eco-industrial park strategy. The Recycling Resources Processing Park in Zhenhai district, Ningbo will be taken for example. Finally, this essay will further investigate the recycling industry in Ningbo based on the interviews which I conducted before. It seems that the problems which appeared in the recycling industries in Ningbo after financial crisis should be given more awareness. The quantity of electronic waste that we are generating is increasing nowadays. According to Greenpeace (2008), e-waste (electronic waste) may be defined as a common name for electrical and electronic products that are obsolete, such as TVs, computers, fax machines, audio and video equipments. Constant innovations in technology are benefiting the world. The electronic industry is growing fast. However, rapid technology change has resulted in a fast growing electronic waste around the globe. The amount of electronic waste or products is growing so rapidly that countries must take action now in order to contain the situation. According to SACOM (2008), China now becomes the largest electronic producer in the world. The high speed of growth in this industry means more and more electronic products are being wasted and discarded (UNEP Vital Graphics 2004). Discarded electronic is the fastest growing segment of waste steam in the World (Maxwell & Miller 2008a). According to Greenpeace (2008), it is estimated that e-waste is generated about 20-50 million tons per year in the world. It is estimated approximately that there are more than one billion personal computers in the world currently (UNEP Vital Graphics 2004). It is estimated that in U.S., on average, people replace cell phone every two years (Wooddell 2008). According to Mr. Zhu (2009), discarded e-products can be treated as two ways: One is reuse, if devices are in good working condition they can be cleaned up and repaired in order to be sold to the market as secondhand products. The other is recycling, when devices reach their end-of-life, they are disassembled and recycle the valuable items and materials such as plastics and metals. If the material cannot be reused, it will be recycled. Almost all of the materials such as metals, plastics, batteries and the packaging materials can be recycled and turned into new products. According to UNEP Vital Graphics (2004), a computer contains 23% plastic, 32% ferrous metals, 18% non-ferrous metals, 12% electronic boards and 15% glass. Some computer components can be reused in assembling new computer products, while others are reduced to metals that can be reused in applications. According to Maxwell and Miller (2008b), cell phone as a media technology is widely used. Recycling cell phones leads to significant environmental savings. Cell phones contain a number of valuable resources such as gold, copper, and plastics that can be extracted and recovered in the recycling process (Maxwell & Miller, 2008b). Take gold for example, if we recycled one ton of cell phone batteries, around 100 grams of gold could be separated (Wu 2009). The plastic on the cell phone can also be recycled into new products. Furthermore, when the rechargeable battery can no longer be reused, the battery can be recycled into other rechargeable battery products. The recovered metals can be used by a number of different industries. Many of these products can be reused, refurbished, or recycled. However, e-wastes are poisoning the environment. Wu (2009) reports that improper treatment of waste brings a secondary pollution. Proper recycling and processing is essential due to its hazardous potential (Maxwell & Miller 2008a). The components in many electronic products contain hazardous chemicals that can contaminate ground water and pollute the environment. Many electronic products contain high levels of nickel, lead, and other toxic elements when disposed (Maxwell & Miller, 2008b). Highly polluting process is also used in material recovery activities. The open burning of wastes is widely used in China. When materials cannot be reused, conventional recycling or disposal via landfill often follow. The backward technology is another reason. Because of lack of adequate infrastructure to manage wastes safely, these wastes are buried, burnt in the open air or dumped into water. The processing of electronic waste in developing countries causes serious health and pollution problems such as land filling (Maxwell & Miller, 2008b). Electronic waste may have negative impacts on environment and damages to the public health due to the hazardous constituents, if recycled inappropriately. It is mentioned that disassembly and recycling of e-waste creates a series of environmental problems which is a significant ecological question (Maxwell and Miller 2008b; Zehle, 2008).Toxic substances in electronic waste may include lead, mercury, and cadmium. These substances can cause problems if the products are not properly managed at end of life. Lead which is used in glass of TV, PC and solders is toxic to the kidneys and eventually affecting the nervous and reproductive systems (Greenpeace 2008; Wooddell 2008). Mercury which is used in computer monitors and notebooks is harmful for developing fetuses and can pass through the mother’s milk to babies (Wooddell 2008). Cadmium was widely used in nickel-cadmium batteries for laptops and other portables (Greenpeace 2008). It is reported that the cadmium in one mobile phone battery can pollute three standard-size swimming pools (Wu 2009). It is necessary to increase regulation of electronic waste and concern. The exports of e-wastes from developed countries should be regulated by governments through border control. 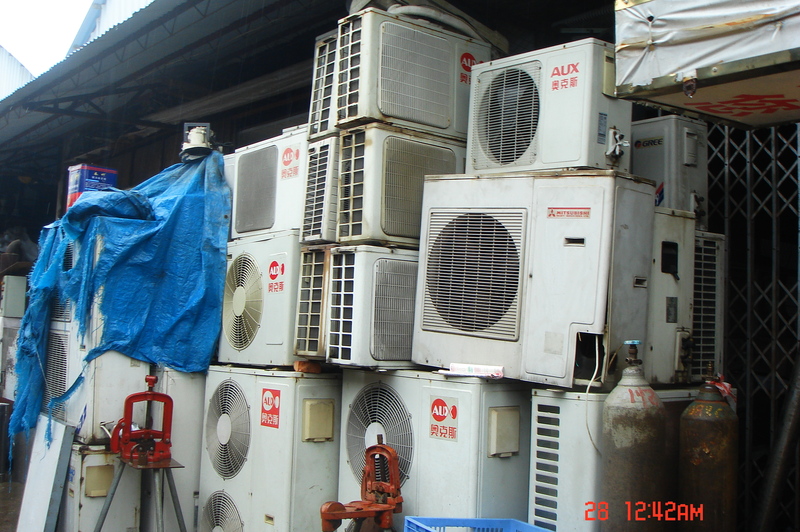 According to Leung, Cai and Wong (2005), e-waste is regulated by the Basel Convention. In the Basel Convention, exporting hazardous waste for disposal to developing countries is banned (UNEP Vital Graphics 2004). Large quantities of used electronics are typically sold to countries without strong environmental laws. Far more electronic waste is exported from developed countries to poor regions with low labor cost and poor supervision and management on environment protection. Many old laptops are routed to developing nations. According to Maxwell and Miller (2008a), In China, since 1996 when the Regulation on Waste Imports for Environmental and Management (Interim) was issued, imports of electronic waste have been illegal. However, there is still a large amount of e-waste exported from abroad. The developing countries are facing huge challenges in the management of electronic waste. Developing countries utilize methods that are more harmful and more wasteful. In developing countries, the waste processing method is simple and usually the wastes are classified and dismantled by hand. The releases of persistent toxic substances may flow to local water supplies and it is harmful to wildlife and humans (Leung, Cai & Wong 2005). According to Chu (2007), more than 500 million tons of e-wastes are generated each year in developed countries and about 70 percent of it is dumped in China. The legal system for recycle of electronic products should be improved in China. Maxwell and Miller (2008a) indicate that there are electronic waste processing areas in Guiyu located in Guangdong Province and Luqiao Qu in Zhejiang province. Leung, Cai and Wong (2005) also conduct a survey in Guiyu and gives more details about heavy pollution in Guiyu. Uncontrolled burning, disassembly, and disposal can cause environmental and health problems due to the methods of processing the waste (Maxwell & Miller, 2008b). Thousands of workers are employed in highly polluting recycling technologies, especially the young women (SACOM 2008). It is reported that children in Guiyu are suffering from healthy problems such as breathing ailments, skin infections, even leukemia (Leung, Cai & Wong 2005). Most of the waste products were sent to illegal treatment factories for extracting raw materials. Zhou (2006) points out that administrative measures were sometimes inadequate for implementing laws. 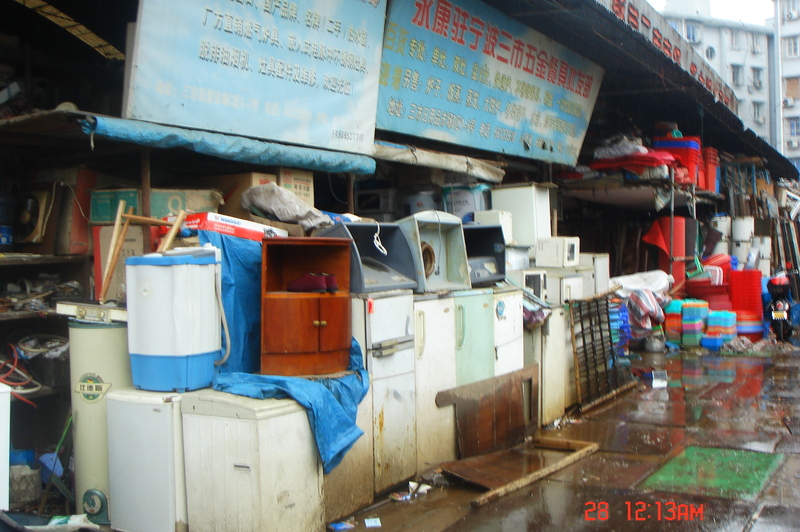 According to incomplete statistics, it is common to collect e-waste illegally in Shanghai (Wu 2009).Wu (2009) reports that e-wastes usually are sold to illegal treatment factories in Shanghai. Illegal factories may refurbish and repair many devices in order to sell them in the second-hand markets. However, in Ningbo, the metal recycling operators should set up registration of the relevant information. If not, they will be punished by the police station (Zhu 2009). Wu (2009) suggest that Government should strengthen the recycling regulations. Recycling helps protect the environment in a number of ways. Recycling these materials conserves our natural resources. Wooddell (2008) states that products are made from valuable resources, such as metals, plastics, and glass, all of them require energy. Reusing and recycling these materials can decrease energy use. The quantity of urban garbage in China is increasing year by year. The best way to solve the problems is recycling. Today the waste recycling business is developed rapidly in all areas. Zehle (2008) indicates that the recycling yards are sprawling around Beijing. Nowadays, there are some reuse and recycling programs. Many corporations offer services for a variety of electronic items. Wooddell (2008) reports that some companies such as Apple and Dell have established programs that encourage consumers to give the discarded products back to the companies so the company can dismantle and recycle them safely. The pollution control for e-waste should be strengthened in designing process. According to Heinonen (2006), ICTs, on one hand, may produce e-waste; on the other hand, as a technological solution, they can be used to reduce environmental pollution. Heinonen (2006) suggests that greater life spans of the products also should be considered during design in order to make products easier to reuse and recycle. Greenpeace (2008) shows that the life span plays the key role in recycling process. Circular economy (CE) has been considered as an important environmental and resource agenda in China. In China, traditional economy is based on the one-way flow of resources, products, consumption and wastes. China has been facing serious environmental and resources problems with its economic development since the 1980s, mainly due to inefficient use of resources (Zhou 2006). The traditional economic development has brought about growing pains including energy shortages, high consumption of resources and pollution. Schauer (n.d.) claims that information technology cannot create a sustainable society automatically. It is essential to boost sustainable development through energy saving and reduction of pollution (Maxwell & Miller, 2008b). Experts say a circular economy which features higher ecological efficiency. Chinese government claims a model for economic growth which aims at environmental protection and sustainable development. Circular economy was officially raised as a target for China’s future growth in the working conference on circular economy held by the National Development and Reform Commission in September 2004 (Zhou 2006). The circular economy, according to Zhang (2004) and Zhou (2006), the circular economy promotes 3R principle: Reduce, Reuse and Recycle. That means reduce your generation of e-waste, reuse still functioning electronic equipment and recycle those components that cannot be repaired. It addresses the relationship between economic development and the resource. Under this model, resources are used with higher efficiency and reused and recycled when possible, so that pollution is minimized and waste is reduced as much as possible (Zhang 2004). Developing a circular economy will help the country to achieve a maximal economic efficiency through minimal energy consumption and emissions. Zhou (2006) insists that it is a significant step in establishing an energy-saving and environment-friendly society. A circular economy will lead sustainable development and building of harmonious society in China. Some Chinese local governments have boosted their circular economies with eco-friendly industrial parks (Zhou 2006). Eco-industrial Park is designed and constructed on the basis of theories of circular economy as well as principles of ecology. It tries to implement a harmonious development in economy, social ecology and environmental efficiency. It shares the responsibility of building up and enjoying the benefits of infrastructure among the members within the park. 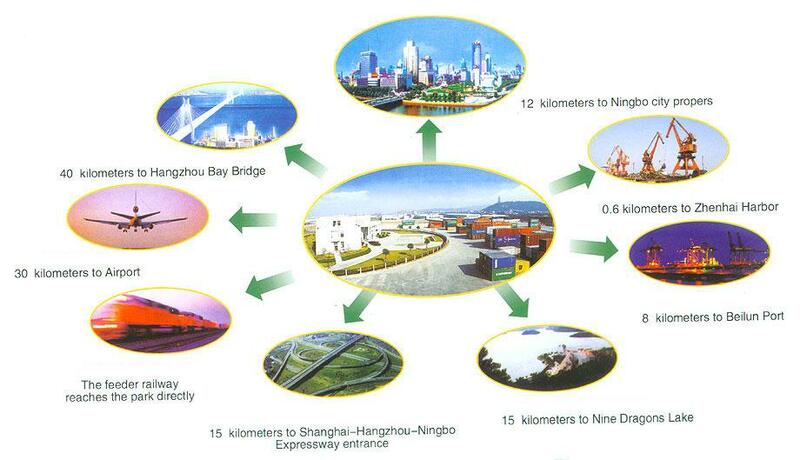 The Eco-industrial Park may be an effective way which achieves economic development and the environmental protection. Ningbo is the second largest port city in China. 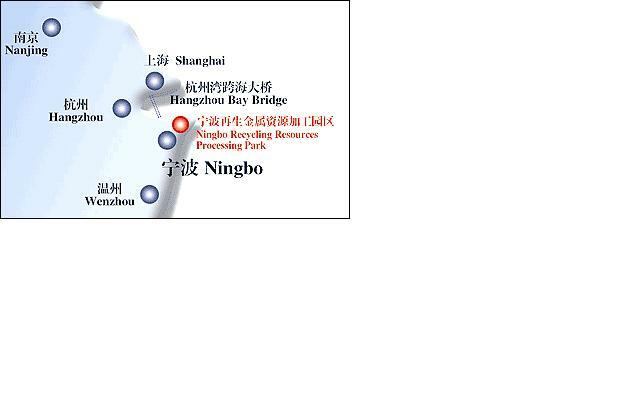 According to the official website of the Ningbo Recycling Resources Processing Park (http://zhrr.com/e-yqgk.asp), the development of Ningbo Recycling Resources Processing Park was initiated by government in Zhenhai. The construction plan was started since April 2001. The total planned area of the park is 3,000 MU. This park can import foreign wastes and will be supervised by the customs, Entry-Exit Inspection and Quarantine Administration. This park is support by the state, the province, the customs office, the Entry-Exist Inspection and Quarantine Administration and the environmental protection bureau. There is a set of professional treatment facilities. The waste metal can be dismantled by the enterprises in the park and sold to other factories. The park has a processing capacity of more than 700,000 tons per year after being built up. The enterprises in the park can enjoy most favorable tax policies such as exempting and subsidy. Outside the recycling resources processing park, many recycling companies are struggling to survive. According to Mr. Zhu (2009) who is the secretary-general of the Renewable Resources Industry Association in Ningbo, at present, there are some prominent problems: Firstly, the recycling businesses dropped off sharply since August, last year. Because of the global financial crisis, a lot of businesses have depressed. At the same time, the requirements of coppers, irons and plastics which are raw materials of the manufacturers become decreasing. Mr. Yu (2009) is a recycling businessman; he said that from last year, his business lost a lot of money. Because metals such as copper and aluminum are sold and bought in the futures market, the financial crisis has a significant on the recycling business. During the global financial crisis, the prices of the wastes in the recycling market are reducing continuously in Ningbo. Mr. Zhu (2009) told me that the prices of waste plastics and paper fell 50%, the prices of nonferrous metals such as copper, stainless steel fell 60%. Some recycling companies went bankrupt; survivors are still bitterly waiting for better prices. This depressive situation is all over in China. Levin (2009) reports that the recycling industry has gone to collapse due to the global economic crisis. Junkmen, recycling companies and factories have been affected and found it is hard to survive. Levin (2009) also indicates that because the prices of wastes have declined rapidly, wastes have to be stored and cannot be recycled immediately; it is harmful to environment and people’s health. Furthermore, because it is difficult to earn money through waste recycling, some junkmen have to change jobs and try to find another job for surviving. This may be cause social problems. The junkmen engage in the trash classification and contribute to the recycling economy because they have strong practical experiences. As the statement of Mr. Zhu (2009), the recyclers are not well educated. Junkmen have lower working conditions which should be improved. At present, they may face the situation of unemployment or low incomes. In conclusion, it seems that the recycling industry is vital for urban development. Electronic waste processing systems have regulated in recent years. It is still difficult to control pollutions. It is vital to enhance the environmental awareness of improper waste recycling. In addition, the recycling should be encouraged by the government. Traditional mode of economy which consumes a large amount of energy is no longer suited to future economic and social development. Waste industry as a new industry, it is difficult to attract the investment if there is no good, relaxed policy environment. The government should find an effective path in the economic development. Some neo-industrial parks have established such as Recycling Resources Processing Park in Zhenhai district, Ningbo. This might give an example to how to develop circular economy. However, the recycling industries are in complex situation. In Ningbo, expect the Recycling Resources Processing Park; there are still a lot of small recycling companies which scatted in the suburban district and community areas. Because of the financial crisis and new tax policy, they are hard to survive. It is essential that government should promote the development of waste recycling industries in order to achieve economic, social and environmental harmonization. Governmental policies play an important role in effective management of recycling industry. So it is still worthy to further investigate how to make and implement the reasonable policies and regulations. 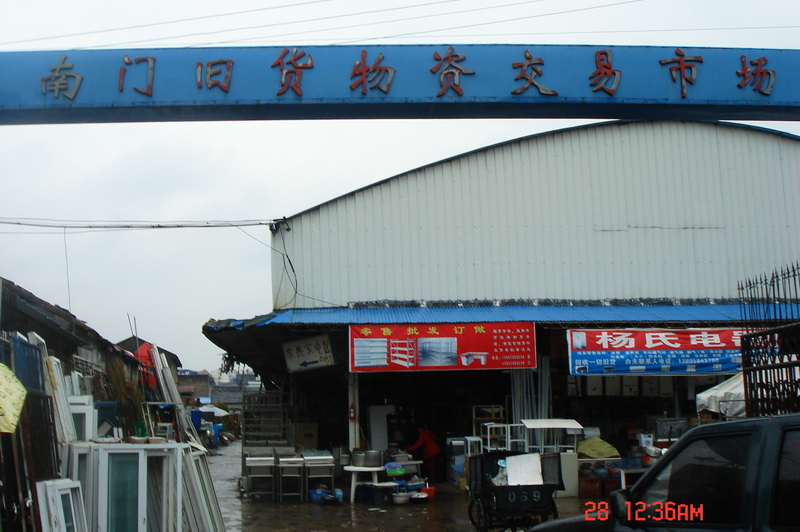 The Housun Renewable Resources Recycling Market which is located in Haishu District is a large junk distributing center in Ningbo. It is reported that the Housun Renewable Resources Recycling Market is the major junk distributing center for Haishu, Jiangdong, Jiangbei and Yinzhou Districts. It occupies nearly 30,000 square meters. Waste irons and steels are flowing to large scale iron and steel enterprises such as Baoshan Iron and Steel Factory, Hangzhou Iron and Steel Plant, etc. Nonferrous metals are mainly treated in Ningbo such as Baoxing Stainless Steel Factory, Jintian Copper Group and some electrical appliances manufacturers in Cixi. Waste papers are flowing to paper manufacturers in Zhenhai. Waste plastics are received and processed by plastic production base in Yuyao and Cixi. There are about 30 recycling companies in the Housun Renewable Resources Recycling Market. The volumes of waste trades are 3,000-4,000 tons and the amount of businesses are more than 100 million Yuan per year. However, the businesses dropped off sharply since August, last year. Currently, we can see that there are seldom delivery vans. The wastes are piled in the yard. Because of the global financial crisis, a lot of businesses have depressed. At the same time, the requirements of coppers, irons and plastics which are raw materials of the manufacturers become decreasing. During the global financial crisis, the prices of the wastes in the recycling market are reducing continuously in Ningbo. Because it is difficult to earn money through waste recycling, some junkmen have to change jobs and try to find another job for surviving. Some recycling companies went bankrupt; survivors are still bitterly waiting for better prices. Zehle (2008) indicated the notion of “network ecologies”. Urban development in many cities of the world will be influenced by local, national and regional politics and institutions. Local and national politics have played the most important role in current urban development. 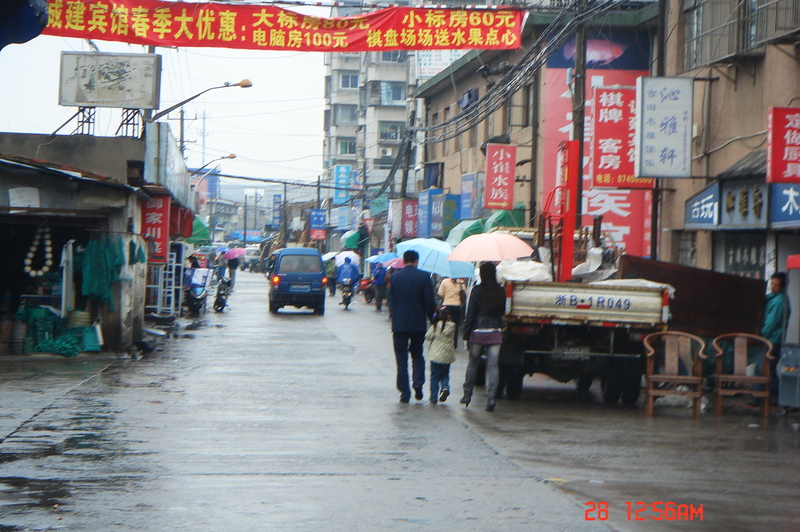 Industrialization which is rapidly developing in China results in a mass consumerism through material gain. Zehle (2008) mentions that the recycling yards around Beijing are sprawling. Urban development needs resources and produces wastes. According to Conley (1997), Ecopolitics is a study of environmental awareness – or non-awareness. It means that we think about the conditions of life, space and the world in an ecological way. Verena Andermatt Conley gave strong ecological consciousness which can make long-range effects. Ecopolitics poses questions to technologies and concerns with the environment. Neo-industrialization in the new economy is an integral approach to economy, ecology and space and bringing in new activities. Although Hong Kong, Shanghai, and Beijing are well developed, Petersen (2003) argues that in the global market, Chinese companies lack competition because of the limits of capital, advanced technology, developed markets, and name brand recognition. It is hard to for Chinese companies to reduce costs and increase profits. Many national companies will take a risk of going bankrupt. This will result in social problems such as: unemployment. Furthermore, during the urban development, rural labor will be eager to move to the urban areas. However, their working condition and life quality are not optimistic. Zehle S (2008) ‘Network Ecologies: Documenting Depletion, Exhausting Exposure‘, Urban China 33: 30-31. Conley VA (1997) Ecopolitics: the environment in poststructuralist thought, Routledge, London. Retrieved April 26, 2009 from ebrary database. According to Thomas Schauer, on one hand, the Informational Technology can improve economy, however, on the other hand, IT brings problems which are the risks to develop sustainable society. Just as Richard Maxwell and Tobby Miller indicate that media technology has the ethic and environmental problems which should be taken into more consideration. My essay will take Ningbo for an example to explain how the wastes are recycled, especially the E-waste, and what is the problem during recycling. Why it is important to recycle E-waste? How is it affecting our environment? What are the treatment processes of E-waste? Are they managed in a safe way? Is there any import of hazardous E-waste in Ningbo?